REUTERS/Jason ReedU.S. 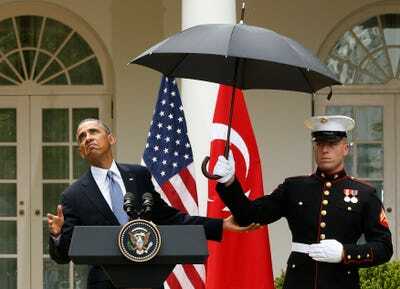 President Barack Obama checks to see if he still needs the umbrella held by a U.S. Marine to protect him from the rain during a joint news conference with then-Turkish Prime Minister Recep Tayyip Erdogan in the Rose Garden of the White House in Washington, May 16, 2013. The US and Turkey are headed for a showdown over Syria, as evidence mounts that Ankara is enabling groups that Washington is actively bombing. Discord between the two allies is now more public than ever following a new report by Dr. Jonathan Schanzer and Merve Tahiroglu of the Foundation for Defence of Democracies. “Bordering on Terrorism: Turkey’s Syria Policy and the Rise of the Islamic State” details Turkey’s apparent willingness to allow extremists — including militants from the Islamic State (aka IS, ISIS, or ISIL) — and their enablers to thrive on the 565-mile border with Syria in an attempt to secure the downfall of Syrian dictator Bashar Assad. “The IS crisis has put Turkey and the US on a collision course,” the report says. “Turkey refuses to allow the coalition to launch military strikes from its soil. Its military also merely looked on while IS besieged the Kurdish town of Kobani, just across its border. Turkey negotiated directly with IS in the summer of 2013 to release 49 Turks held by the terrorist group. In return, Ankara reportedly secured the release of 180 IS fighters, many of whom returned to the battlefield. REUTERS/Murad SezerU.S. 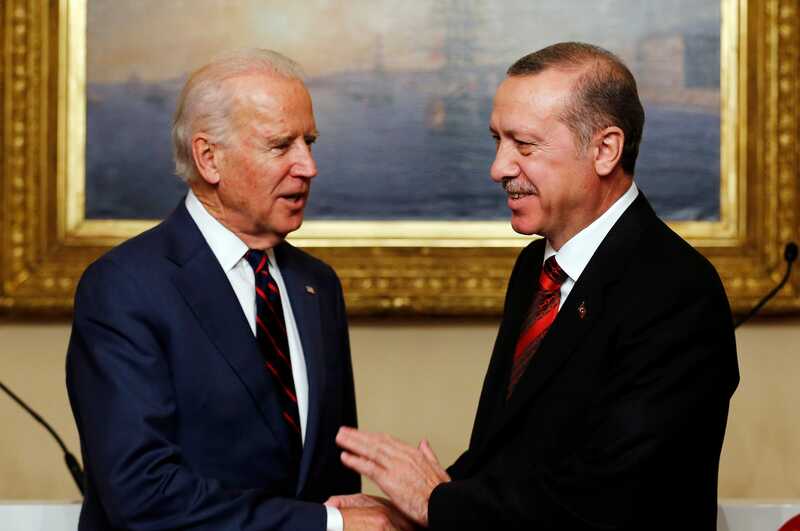 Vice President Joe Biden (L) meets with Turkey’s President Tayyip Erdogan at Beylerbeyi Palace in Istanbul November 22, 2014. Throughout the Syrian civil war, Turkey’s southern border has served as a transit point for cheap oil, weapons, foreign fighters, and pillaged antiquities. As the conflict progressed, the fighters taking advantage of Ankara’s lax border policies were more and more radical. “What began with scattered opposition forces exploiting the border became something that was really focused on the Muslim Brotherhood, which then became something that was utilized by [the Salafist rebel group] Ahrar al Sham, which was then utilized by [the Al Qaeda affiliate] The Nusra Front, which is now utilized by ISIS,” Schanzer told Business Insider. He added that given various reports of jihadi financiers sitting in hotels on the border between Syria and Turkey, “it is impossible that [Turkey’s intelligence agency] MIT is not aware” of what’s going on. The financiers “are doling out cash to those who come back with videos of attacks, proof of what they have done against the Assad regime or other enemies,” said Schanzer, who previously detailed Turkey’s terrorism finance problem to Business Insider. Those videos are then used as propaganda to raise more money for funding fighters. 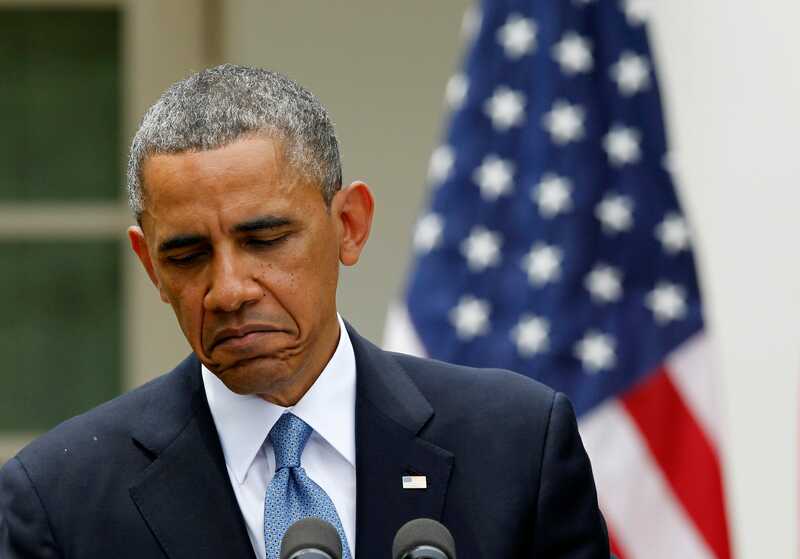 The report notes that policy of the administration of US President Barack Obama regarding Syria may have indirectly instigated Turkey’s dangerous policy. After supporting Turkey’s cause of ousting Assad, Washington didn’t follow up with significant support to the moderate opposition while Assad dropped Scud missiles and barrel bombs on playgrounds and bakeries. Obama then balked at enforcing his “red line” after Assad’s forces killed an estimated 1,400 people in four hours by firing rockets filled with nerve gas on rebel-held territory near the capital. “I was in Turkey during the Ghouta attacks, and [Turkish officials] were incredulous,” Schanzer said. “They believed that the United States was squarely behind [Turkish President Recep Tayyip] Erdogan, not only just in terms of steering Syria into soft landing, but also that it would back up its words with deeds and take action in light of an ongoing slaughter. The policy Ankara apparently embraced is particularly troubling. 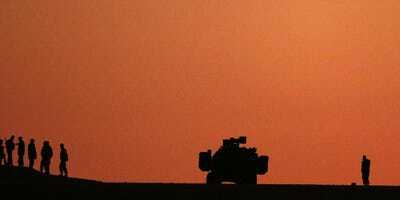 Turkish soldiers watch fighting between Kurdish fighters and Islamic State militants, from atop a hill overlooking the Syrian town of Kobani, near the Mursitpinar border crossing on the Turkish-Syrian border in Sanliurfa province November 5, 2014. ReutersA look at the border between Turkey and Syria as of mid-September. Schanzer said that as the suspected presence of ISIS inside Turkey increased, and with it support inside Turkey for ISIS and other extremist groups, it becomes that much more difficult for Turkey to do anything. “They have inadvertently created a mechanism that can yield blowback for them that could be extremely painful,” Schanzer said. “You have a lot of people now that are invested in the business of extremism in Turkey. If you start to challenge that, it raises significant questions of whether” the militants, their benefactors, and other war profiteers would tolerate the crackdown. Tensions between Ankara and Washington won’t dissipate “so long as Turkey tries to remain neutral with regard to ISIS while all of these things are happening on its border,” according to Schanzer. 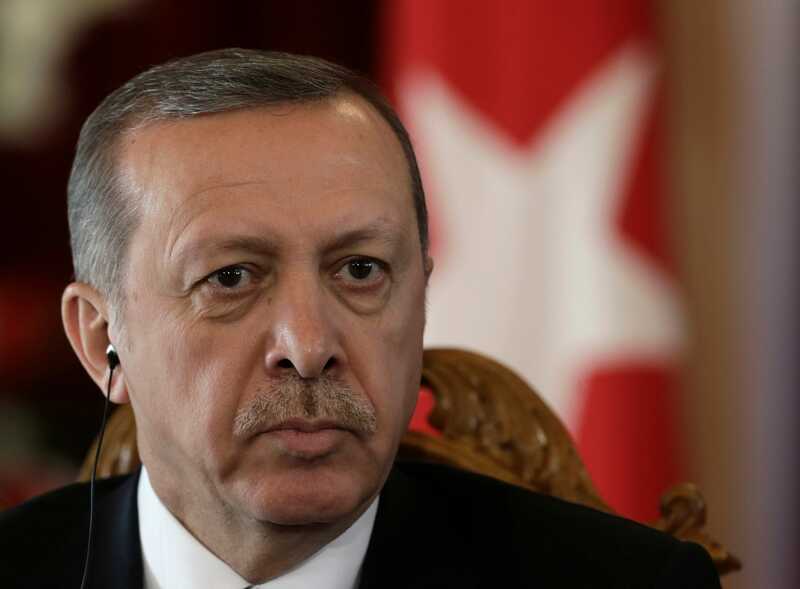 REUTERS/Ints KalninsTurkey’s President Recep Tayyip Erdogan listens during a news conference in Riga October 23, 2014. “A lot of this is going to come down to the will of Ankara right now,” Schanzer said, adding that a lack of cooperation could result in Treasury Department sanctions against “individuals who are taking an active role in these illicit pipelines” on the Turkish side of the border. “After that, I think we do begin to question whether security or intelligence cooperation can continue when there isn’t an honest give and take with what’s happened,” Schanzer added. The report concludes that Ankara must understand that “while America’s Syria policy may have been feckless, its border policy has been reckless.” And the repercussions of doubling down even further would jeopardize relations with a crucial ally.